We have a freakishly long driveway or so it seems to me every time it snows. During the summer months I never think about the length of the driveway. In fact, when it is not snow covered, I appreciate its ability to accommodate several cars. 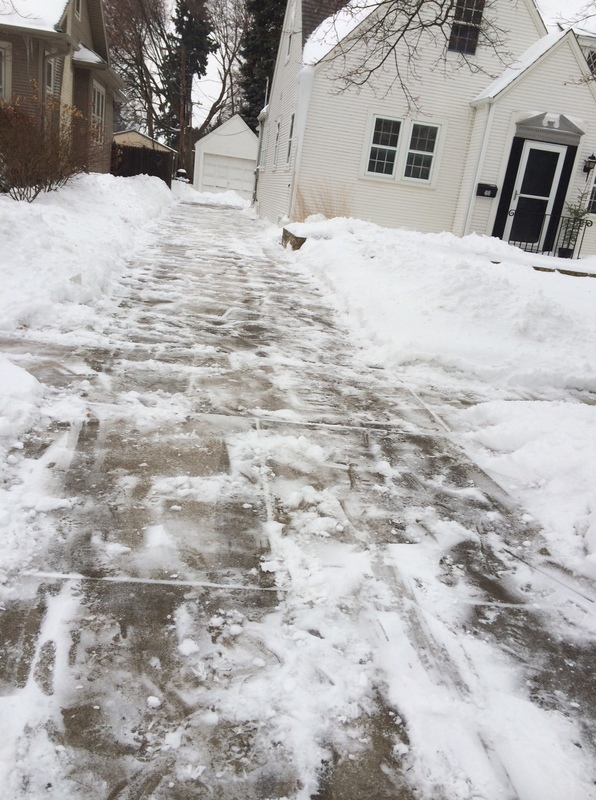 Valet services everywhere might lust after our snow-free driveway. Our neighbors routinely mistake our driveway for the approach to a country club. Last night Skip took the train up from Chicago. It was his first visit to our house. His first question to me upon seeing the house was, “Are you the snow blower?” He immediately recognized the freakish length of the driveway due to the massive piles of snow that currently define it. Skip also knows I have an excessive amount of hot air (so I am capable of literally blowing snow when on a good rant) that interrupts any sense that I might actually possess. Point-in-fact, we have a snow blower that sits comfortably in the garage. It requires a goodly amount of maintenance or perhaps a single bullet to the engine. I’ve considered mounting it on a pedestal for my yard maintenance sculpture series. Had I confessed possession of a snow blower Skip would certainly have asked, “Does it blow snow?” What an absurd question! Of course not! There’s something in me that likes a challenge. Last night it snowed and I couldn’t wait to step into my big Wisconsin boots, grab my new green shovel (I broke the old orange shovel in the last heavy snow), and get to it! Kerri shook her head and reminded me that people “my age” routinely expire from excessive snow shoveling and, since we have a freakishly long driveway, there is excessive snow to shovel. She made it sound like my demise was not only possible but imminent. She said it was simple logic: if A) excessive snow shoveling causes early dirt napping and B) there is excessive snow to shovel, then, C) my shoveling excessive amounts of snow excessively would likely lead to early dirt napping. I reminded her that we are both artists and logic rarely interferes with our decision-making. “Then take your time,” she admonished. “Go slow.” Ah! In the rebuke of logic, a little bit of Zen is always welcome. I shoveled snow slowly and survived. I paused often to breathe-in the cold and listen to the wind.